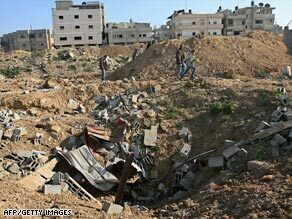 JERUSALEM (CNN) -- Israel launched air strikes against a number of targets in Gaza Monday to retaliate against Palestinian militants who have fired a "barrage" of rockets inside the Jewish state in recent days, the military said. Israel says its air strikes in Gaza are aimed at stopping rocket attacks into the south of the country. The targets in Monday's air strikes included two Hamas outposts in southern and northern Gaza, the Israel Defense Forces said. The IDF said militants fired two rockets at Israel Sunday. The recent rocket fire brings to more than 35 the number of Qassam rockets, mortars and Grad missiles that have been fired at Israel since Israel and Hamas agreed to separate cease-fires on January 21. Rockets fired from a Grad have a longer range than the crude, home-made Qassams that Palestinian militants in Gaza fire more frequently. Militants have used Grads strike farther into Israel. Israel and Hamas, the Islamic militant group that has ruled Gaza since 2007, declared separate, tentative cease-fires following more than three weeks of fighting in Gaza. Israel launched the attack on Hamas in Gaza on December 27 with the stated aim of ending rocket attacks on southern Israel. The air strikes come one day before Israelis are due to go to the polls in a national election that is expected to be dominated by the issue of security.